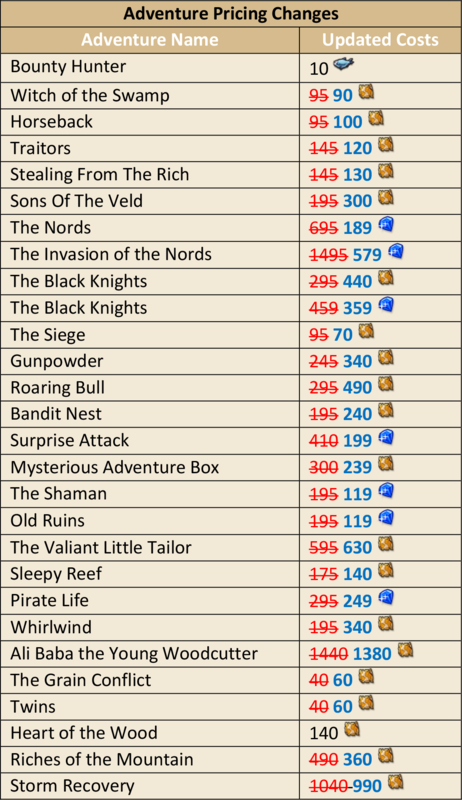 With the upcoming change, we will adjust the prices of adventures in the merchant. There are several reasons behind those changes, and I would like to explain them shortly. In September 2017 we introduced a new difficulty system for adventures. Those changes also included adjustment of types, themes and much more. We wanted to adjust the prices to those changes to make sure they remain consistent through the whole game. This is specifically important in combination with the Adventure Seasons (Pirate, Coop, Cultist ... ). Another important goal is to create a consistent balancing formula, which will allow us to introduce more adventures (also follow up adventures) and let the system balance the price accordingly. This formula includes modifiers for the amount of players, the unlock level but also the type of the adventure. The game is growing and we are introducing new opportunities for you regularly. This leads to an increasing amount of specialists and the increasing capabilities of the economy on the island. We adjusted the pricing to avoid a high value drop for map fragments due to the amount of the resource generated in the game through specialists and other content. Todos horários são GMT +3. Hora atual: 23:12.